You certainly don’t need to tuck in to the world’s most lavish and expensive desserts to watch the carb count in 2016. While eating healthily is something that we all want to do, it certainly shouldn’t involve breaking your bank account! 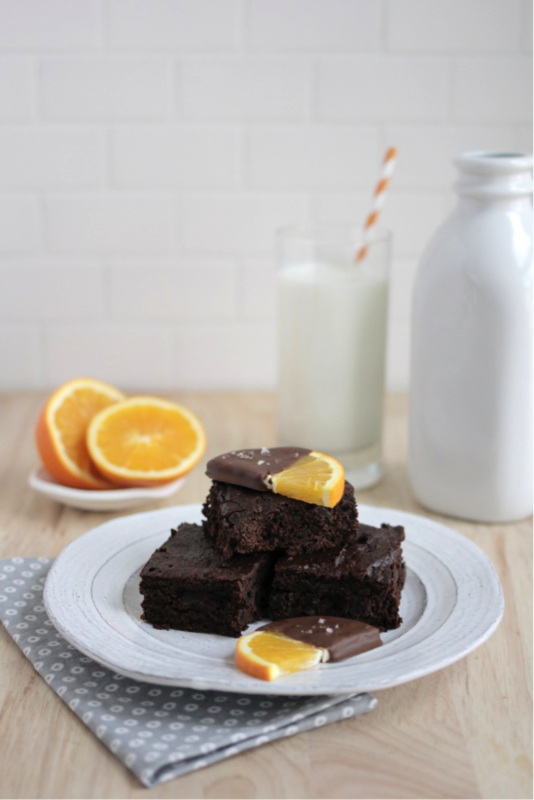 These chocolatey treats have the advantage of being sweet without any added sugar. The sweetness comes from the dates, and because of this they are also a high source of energy. Pour your dates into a bowl and cover them with some water. Leave them to sit for an hour, then drain the water and de-seed the dates. Place the dates, ½ cup of shredded coconut, almond meal, cocoa powder, coconut oil and the chia seeds in a blender and process them and they are smoothly mixed together. Next, put this mixture in a bowl and leave it to sit for 20 minutes, so that the chia seeds become soft. Put the rest of the coconut on a plate. 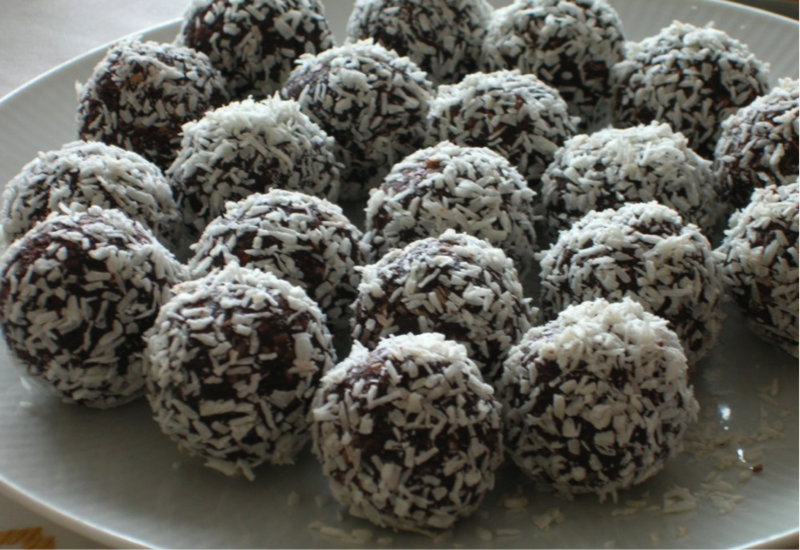 Use your hands to roll even sized balls out of the mixture, and then roll them in the coconut so that they are nicely coated. This cheesecake, although it has no real cheese, is in my opinion even tastier than the real deal. The creaminess comes from the coconut, and this gives it a richness that is completely natural and healthy. Place the 1 and ½ cups of cashews in a bowl and cover it with water. Leave this to soak whilst you create the base. Put all the ingredients for the base in a blender, and process them at max speed until you get a light crumb texture. Squish the mixture into the bottom of spring form pan. Put the base in the fridge whilst you make the top. Drain the soaking cashew nuts and transfer them to your blender. Add to it a tablespoon of coconut cream and process this at max speed. Put another tablespoon of coconut cream in the mixture, and then with a spoon make sure that the mixture is all in the middle of the blender and not stuck to the sides. Blend again until the mixture is smooth. You can add another tablespoon of cream to give it extra richness, but this is an optional step. Place the rest of the ingredients in the blender and process them until everything is properly mixed and the texture is smooth. Pour the blend on top of the base and then freeze this for 4-6 hours until it sets. These brownies rely on a lot of unusual ingredients, but once you have them they are quick and easy to make, and the avocado creates a rich smooth texture which is both healthy and delicious. Note: Not all grocery stores stock date syrup, stevia powder/liquid, psyllium husks and unsweetened carob chips but this can be found at health food shops or at online health shops. Add in the oat flour, regular flour, cacao powder, psyllium husks, baking soda, baking powder, salt, and carob chips to the mixture and process them until everything is mixed together. At this point the mixture should be thick. Place the orange zest and extract into the mix and blend until they are well mixed in. This will give it a subtle orange flavour, so if you want it to be stronger feel free to up the quantities of these. Pour the carob chips into the thick mixture and stir them in by hand. Pour the mixture into the pan and make sure it is evenly spread out (this can be done well with the back of a spoon). Place it in the oven and bake for 25 minutes. Sometimes it needs a little longer, but it is worth checking at this point to make sure you aren’t over cooking them. The best way to check if they are done is to stick a toothpick in them – you want it to come out clean on top but gooey on the bottom 1/2” of the pick. Leave them to cool down for about 15 minutes and then serve. This vegan recipe is a great one for dinner parties if you want to show off some healthy cooking skills. 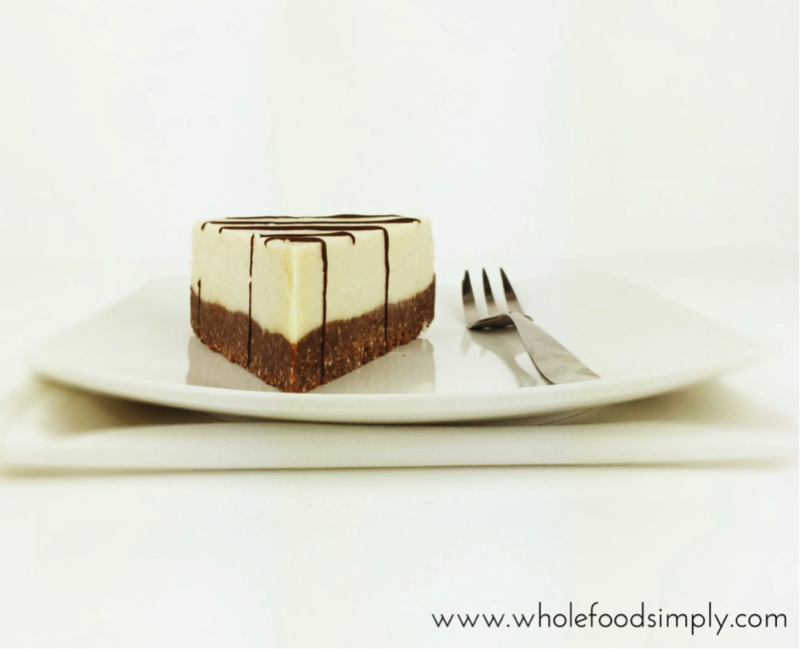 This cake is made from all natural ingredients and does not need baking. It is sweet, but deceptively nutritious and healthy, as it uses both fruits and nuts. Fresh strawberry and raspberry, or whatever fruits you like. For the crust, place the nuts, dates sea salt and water in a blender and process them until the nuts crumble and the blend becomes sticky. Line an 8” spring form pan with cling film and place the mixture into it so that it is firm and even within the pan. Place this in the fridge and leave it to set for 20 minutes. Wash the blender so you can make the cashew cream. Place the cashews, coconut oil, lemon juice, vanilla extract and blue agave syrup in a blender and process them at high speed so the mixture becomes smooth and creamy. Get your crust from the fridge, and then transfer half of your cashew cream on top of the crust, and make sure to spread it out evenly so that it coats the entire base. Next, put the strawberries in your food processor and blend it until smooth. Pour this on top of the cashew cream and make sure it evenly spread. Cover the pan with cling film and freeze your cake for a minimum of 4 hours, but ideally overnight. Remove the cake from the freezer 15 minutes before you serve it. 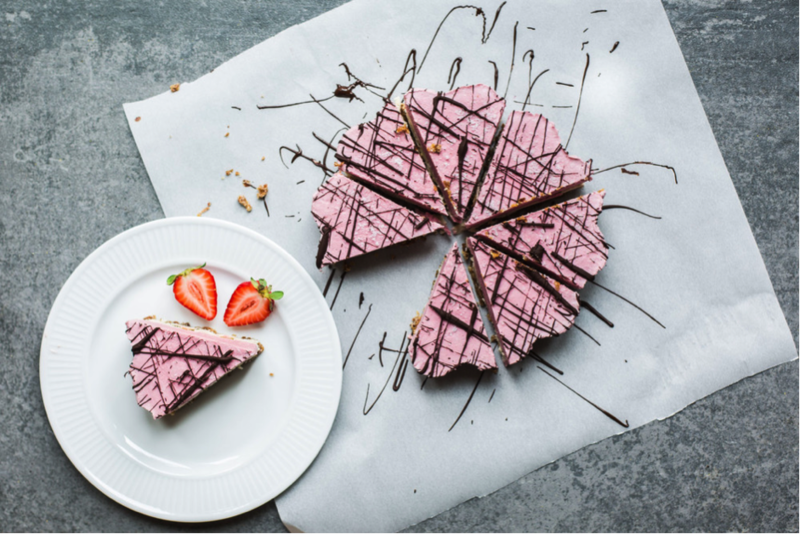 Melt some dark chocolate and drizzle it over the cake, and once the cake has softened ever so slightly, slice it into even pieces and serve it with some fresh strawberries. 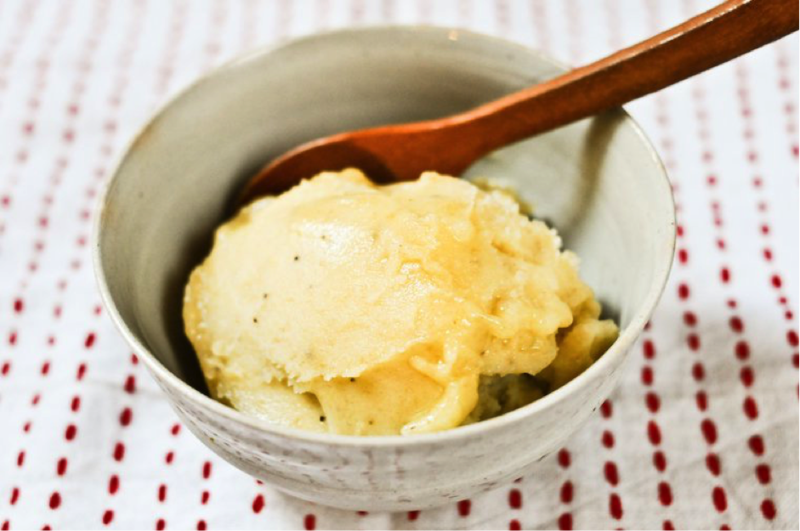 Lastly, there is the banana sorbet, which is the easiest and cheapest healthy treat to make. It requires only one ingredient – a banana. I would use a banana per person, so if you are making this for more people you will need more than one banana. Peel and dice the banana and leave it in the freezer overnight or until frozen. Place the frozen banana slices in blender and blend until smooth. The banana will stick to the outside of the blender, scrape it off and place it back in the middle and keep blending. Repeat this until you have a smooth texture. All of these recipes are relatively easy to make, and have the brilliant advantage of being tasty and healthy at the same time. Now you can maintain a healthy diet without having to cut out sweetness.